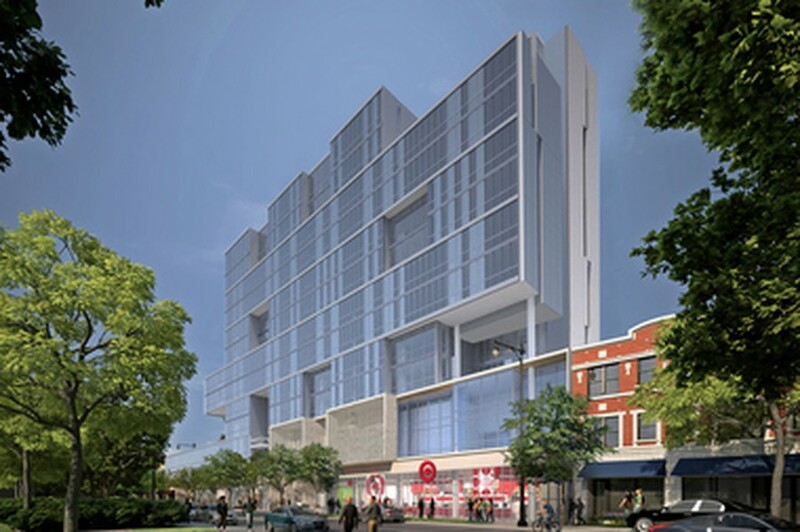 Target plans to open a new store on 53rd Street in the Vue53 development. On March 15, Target announced that it will open a new store in Hyde Park in the Vue53 development, near the intersection of 53rd Street and Kimbark Avenue. The new store will open in late fall 2016 or early spring 2017 and will take up 21,000 of the 28,000 square feet of retail space available in Vue53. Its merchandise will include expanded beauty products, apparel, kids and baby items, a curated home selection, tech accessories, and select grocery products. The store will also offer a pharmacy, Target Mobile, and order pick-up services. James Hanson, a principal at Avison Young, the development firm behind Vue53, said that Target first conducted extensive market research about the Hyde Park area and local consumers before approaching the development project. “When you’re the developer of a project which is going to have a retail component, if you have the opportunity to have a retailer the size and prestige of Target enter your shopping center, you jump right on that opportunity. It’s really more a situation where Target found us. I think they had determined as part of their rollout of new urban stores in Chicago that they wanted to be in Hyde Park and then once they looked at the Hyde Park retail landscape…Vue53 offered what they were looking for,” Hanson said. According to a Chicago Tribune article, the 53rd Street store will be one of Target’s smaller, flexible format stores designed specifically for urban environments. “In the urban stores, they’re looking at shoppers making frequent trips to buy smaller amounts of goods, probably walking, biking, or using public transportation, as opposed to a typical suburban Target store where they’ll maybe be coming once a week, stocking up on things, and driving in their car,” Hanson said. Target currently operates 19 flexible format stores and plans to open 18 additional locations over the next two years, including a store in Lincoln Park later in 2016 and another in Lakeview in 2017. The Vue53 development has been a subject of controversy due to concerns of increased congestion and lack of parking on 53rd Street. Hanson said that research conducted on driving patterns and urban car owning habits indicates that Vue53 will not substantially add to traffic on 53rd Street. Some of Vue53’s over 200 parking spaces will be available to Target shoppers. The residential component of Vue53 also seeks to be open in the fall of 2016, with development currently aiming for September in order to allow UChicago students and employees to live in Vue53 for the fall term. The complex will be silver certified by the Leadership in Energy and Environmental Design (LEED) and contain 267 apartments, half of which will be furnished. The remaining 7,000 square feet of Vue53’s retail space will likely be divided into three or four additional retailers. No leases have been signed yet.